Statistically, life has never been safer. Yet worry has reached epidemic proportions. So what has gone wrong? Many Christians are suffering in silence, unsure if psychological solutions are appropriate for them, or if biblical teaching can lead them to freedom. 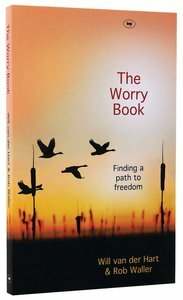 ^^The Worry Book: Finding a Path to Freedom offers a fresh solution: seeing the process of worry as the problem, rather than getting stuck into individual concerns. We can use worry to create a sense of certainty and control, but the illusion is temporary, and we generate even more problems in the process. Here we learn about the factors behind worry, and how to disable the cycle of worry and tolerate uncertainty - principles we can apply to every situation. ^^This is a journeyman's guide through the comedy and heartache of discovering worry's function, and so removing its power. Good theology and psychology combine to offer new perspectives and real hope. About "The Worry Book: Finding a Path to Freedom"
Dr Rob Waller is a Consultant Psychiatrist working for the National Health Service in Scotland. He is married to Susanna and lives in Edinburgh with their sons James and David. His special interests are in Medical Education and Spirituality. He is also qualified in Cognitive Behavioural Therapy, and is on the Board of Mercy Ministries UK. Rob wants to empower mental health professionals to use their skills in a Godly way and inform the places where they work. He believes the good news of Christianity brings an essential contribution to mental health services. See more on his personal website.